Warhammer 40,000: Inquisitor - Martyr has been out for a month now on the PC and will be out on consoles soon (more on that in a bit). Yesterday, developer Neocore Game dropped an update that adds a new mode, called "Warzone," to the title and it is intended to give endgame players a way to get better gear and new skills (that can be used in the mode). It kind of looks like a mix between a "Survival" mode and Rifts from Diablo III. The Warzone mode is, essentially, the cap to the end of what Neocore is defining as a "season" in the game, as they detailed in a post last month. The new season will kick-off sometime later and introduce, among other things, a new enemy faction (the Dark Eldar), new gear, and a new level cap. As for the Warzone itself, the mode introduces five narrative stages that have their own storyline, which plays out across 10 battles (levels). Each battle challenges players with fighting off hordes of foes within the confines of individual rooms. Battles will also have modifiers ("hazards") that will change up the way you approach each one. For instance, in one battle, enemies may leave pools of acid when they die, or spawn a demon. These will be cumulative up to the final battle after which players will be able to tackle the "Endless" mode where they can set their own hazards and try to challenge themselves for better gear and for "Favours," which can be collected to take on a special "Nemesis" boss that, naturally, will have the best gear drops. Oh, and in case you were worried, you'll be able to play through all of it with up to three other players online. Full details about the Warzone and what it entails can be found over on the Neocore website. 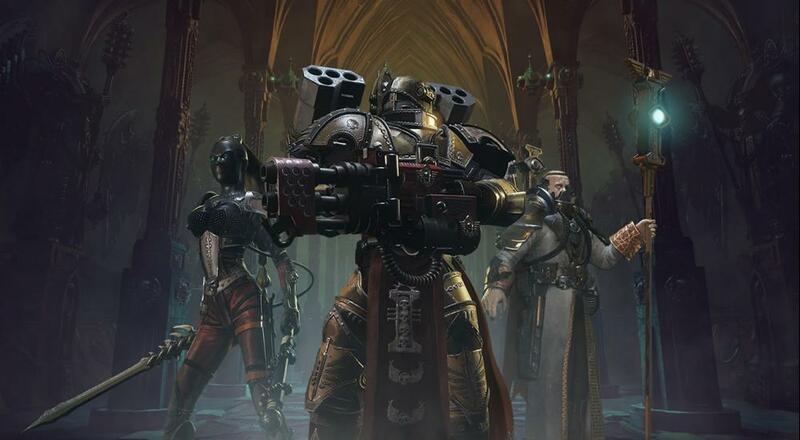 Warhammer 40,000: Inquisitor - Martyr is currently available on PC via Steam, and will be available on PlayStation 4 and Xbox One on August 23, 2018 (for real this time). Four player online co-op is supported in all missions outside of the campaign. Page created in 0.3876 seconds.